British Airways has criticised Border Force over "serious inefficiencies" that have caused both citizens and visitors to endure long delays at UK airports. The airline is concerned that only a third of the 29 electronic passport gates are open at Heathrow Terminal 5. BA says the gates shut prematurely at 23:00 while customers are still disembarking, causing huge queues. The Home Office has said it strongly disagrees with BA's remarks. 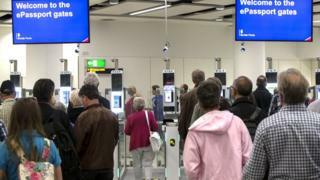 Back in 2015, when the electronic gates at Terminal 5 were opened, the Home Office said that the technology would help the Border Force to process a higher number of low risk passengers "more quickly and using less resources" to reduce queuing times. The electronic gates were meant to help border control officers to focus on "more priority work" like cracking down on people trafficking and drug smuggling. However, since many of the gates are often closed, families returning from holidays have been facing long queues to pass through immigration, particularly late at night. "It is a constant frustration to us and to our customers that after a long flight they have to stand in queues, sometimes for over an hour, just to get back into the country," said Raghbir Pattar, British Airways' director of Heathrow. "And it is a dreadful welcome for visitors to the UK... It adds insult to injury when you're stuck in a queue but can see numerous gates which just aren't being used." British Airways has submitted its concerns to the Home Office and hopes that action can be taken to reduce unnecessary delays. Mr Pattar said: "We recognise some of the steps being taken by Border Force to improve the service they provide to travellers. However more focus must be put on operating in the most efficient and flexible way and ensuring that passengers' needs are put first." Heathrow Terminal 5 currently only serves BA and Spanish airline Iberia. A spokesperson for Virgin Atlantic told the BBC: "This hasn't been a particular issue for our customers as all our flights land before 10pm." The Home Office strongly disagrees with British Airways' comments. "This statement significantly misrepresents the experience of the vast majority of passengers arriving at Heathrow this summer," a spokesperson said. "More than 99% of British and European passengers arriving at Heathrow are dealt with within 25 minutes. For passengers from outside the European Economic Area, 87% of passengers have been dealt with within 45 minutes.